Enjoy spectacular panoramic views of the valley from the rim of the gorge. Tinker’s Creek travels 28.2 miles and is the largest tributary that feeds the Cuyahoga River. The creek drops a dramatic 220 feet over a course of two miles and has carved out a steep, walled gorge. The gorge was declared a National Natural Landmark in 1967. 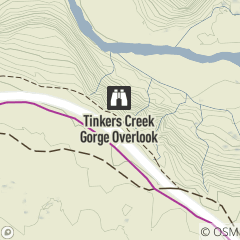 Tinker's Creek Gorge Scenic Overlook offers a spectacular vista particularly in the fall. The Gorge is a National Natural Landmark, which is a site designated by the Secretary of the Interior for its condition, illustrative character, rarity, diversity, and value to science and education. The overlook is wheelchair accessible and located off Gorge Parkway in Bedford Reservation, between Dunham and Egbert roads in Walton Hills. Join Naturalist Pam Taylor as we explore the trails of one of her favorite reservations in the park.